Koby is one of our Nurse’s rescue dogs. She got him from the SPCA as a rather large unruly 1 year old and immediately insured him with Petplan. As a nurse Kat knows how expensive large dogs can be to treat (even with staff discount!). 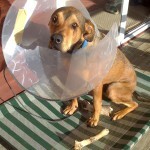 Six months after Koby was insured he was brought into the clinic with a wound on the tip of his tail. “Happy Tail” is caused by excessive wagging and hitting the tail on things – He was just far too happy! He had a course of antibiotics, and a bandage applied. It turns out Koby was a houdini with bandages. The wound just wouldn’t heal and it was decided the best course of action was to amputate part of the tail. 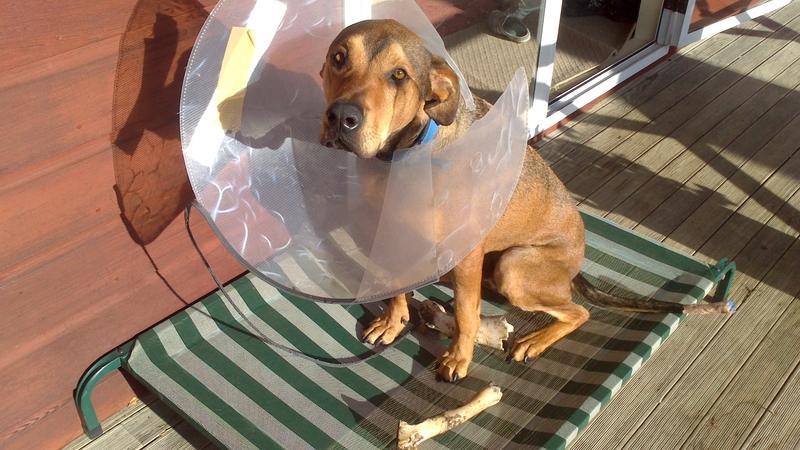 Koby continued to remove bandages, destroy Elizabethan collars and traumatise the tail. This resulted in the surgery being revised – another 2 inches off his beautiful tail. This time we had a big cage type muzzle (which he thought was great!) on him when he wasn’t being supervised. Great news as this stopped him destroying the bandage, however the wound broke down and it required further surgery. Luckily third time’s a charm and his tail is now fully healed, although it’s now 4 inches shorter than the original version. His total vet bills topped over $1000 for this one issue. Kat (the owner) paid $100 excess and is VERY thankful she took out insurance on this handsome boy.